It seems that Shahbaz Sharif and Government of Punjab are trying to make Lahore a top standard international city as they have always brought great projects in Lahore and really have made it a great city. The underpasses in Lahore, the circular road, metro bus project and huge shopping malls. Combining all these things with the historical places in Lahore like Shahi Qilla, Minar E Pakistan, Badshahi Masjid, Allama Iqbal tomb etc etc makes Lahore a great city to visit. 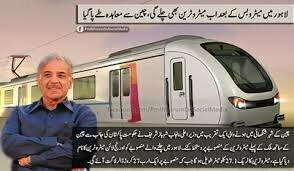 After all these Punjab Government has now decided to run a metro train in Lahore which would be a wonderful facility of Lahori’s. Yes the first metro train will be running in Lahore. The metro train will be covering 27 kilometer distance. Yes this will be a huge relief for people of Lahore as they will get rid of getting stuck in long traffic for hours and from difficulties which they faced in journey of local transport. This huge project will cost 1.6 billion US Dollars. Well the pact was singed by Shahbaz Sharif chief minister of Punjab on 22 May 2014 and from China pact was signed by Chairman of the Chineses National Development Reforms Commission. Not only Shahbaz Sharif was present at occasion but President of Pakistan Mr. Mamnoon Hussain along with President of China Xi Jinping was also present at the ceremony. This will be the first metro train in the history of Pakistan. Shahbaz Sharif Chief Minister Punjab was very happy on the occasion and said that it will be milestone in history of our country. Well such projects really helps a common man of Pakistan. After success of the Metro Bus Punjab Government is very confident that this project will also be a mega successful project of Pakistan. Metro bus project was criticized by many but in the end the people of Lahore are very satisfied by its service. The route of Metro train will be from Ali Town to Thokar Niaz Baig, from Multan Road to Scheme Mor, Chowburji, MAO College, Mall Road, Lakshmi Chowk and Railway Station, from Garhi Shahu Bridge to GT Road and UET and from Pakistan Mint to Dera Gojran. Project is stated to be started at end of year 2014 and will be governed by Chinese authorities. Why only lahore?, Writer contact me : 03208505065 for content help.